Meaningful Health Solutions - Save $100! A375UV Smoke & Multi Gas Air Purifier 2-Pack. Save $100! A375UV Smoke & Multi Gas Air Purifier 2-Pack. Save $100 with a 2-Pack. Up to 1600 sq. ft of purification. Tobacco smoke contains over 4000 harmful chemicals and gases including benzene, formaldehyde and at least 60 carcinogens. The dangerous particles in secondhand smoke can linger in the air for hours. Breathing them even for a short time- as little as 20 or 30 minutes - is harmful and breathing secondhand smoke over years can be all the more dangerous. The Alen A375UV air purifier's activated carbon filter and Photo-Catalytic Oxidation technology will significantly remove and demolecularize harmful toxins and odors generated from secondhand smoke. 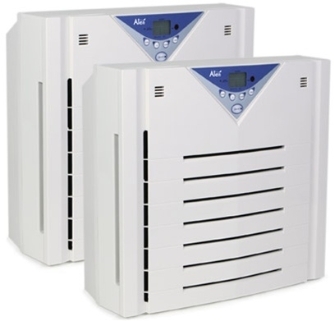 Alen's high performance A375UV Smoke & Multi-gas air purifiers also features our signature HEPA filtration, two ultraviolet lights for bacteria control and an ozone-safe Ionizer. The odor eliminating carbon infused filter in the A375UV air purifier has been tested to remove 98% of airborne allergens like dust, dust mites, pollen, mold spores and pet dander. The Alen A375 air purifier eliminates harmful carcinogens, toxic gases generated from smoke and household items like glue, formaldehyde and some aerosols emission (also known as VOC's). The Alen A375UV Smoke & Multi Gas air purifier removes those invisible yet harmful fumes so you can breathe clean air and at a price that helps you breathe a bit easier too. The A375UV air purifier tested to remove 98% of airborne contaminants in rooms up to 800 sq. ft.
All-in-one filter: washable pre-filter, our signature HEPA filtration and an active layer of carbon for odor control. New! Silver HEPA filter can help you avoid the flu by reducing airborne viruses by up to 50% all the while eliminating 99% of allergens AND 98% of bacteria!